Toyota Welcab disabled access vehicles For sale, UK Registered direct from Japan. THE Best Value in the UK. FACT. Your search with quality and best prices in mind starts and ends here! All available via our unique ‘Import Scheme’. All Toyota Welcab disabled vehicles For Sale in the UK Via Algys Autos. Toyota Welcab disabled vehicles For Sale supplied direct from Japan and fully UK registered with V5 in your name and 12 months Mot. We are thousands cheaper than you will find in UK anywhere – because we are the major Importer & supplier so we are obviously the best UK value. Compare our prices and you will recognise that Algys Autos is, without doubt, the best ‘Value for Money’ in the UK, You will note that the prices offered ‘Import Scheme‘. The Import Scheme was a brain-child of Algys Autos over 20 years ago and many have tried to copy it with little success. The other traders even refer to the idea as the Import Scheme (conveniently dropping the ‘Algys Autos’ of course). The Import Scheme is where Algys Autos allows you to bring the selected vehicle into the UK as a ‘Private Importation’ and thus saves £1000’s. On the disabled access Welcab vehicles we will save you BIG $! We buy any model to your detailed requirements under this scheme via our Garages in Japan. We are the UK premiere importer and supplier and represent over 600 garages in Japan! Our UK garage at Bristol offer full facilities and your car can be delivered to your door via transporter. For full details click the link ‘Import Scheme’ link at the top of the page. These prices represent un-surpassable quality and value for money. Algys Autos Ltd are suppliers of all models to the trade, you too now have the opportunity to purchase at Japan trade prices! We consistently offer the very best value for money in the UK! Simple, we import fresh stock direct from our Japan garages NOT from very inferior UK auctions or from vehicles circulating for sale within the UK. Ask to see the Japanese auction sheet and proof they imported it from Japan…..if they can’t or won’t provide it, turn around, walk away and come to the experts. 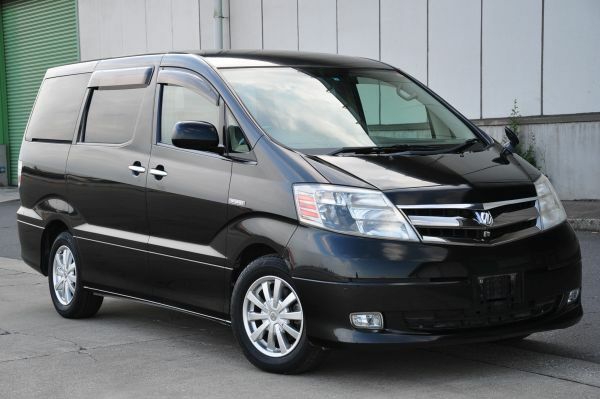 We have continuous access to vehicles throughout Japan Main Dealerships and Japan auctions. All the disabled cars are imported for you via the Import Scheme and supplied via our Bristol garage fully UK registered and documented. 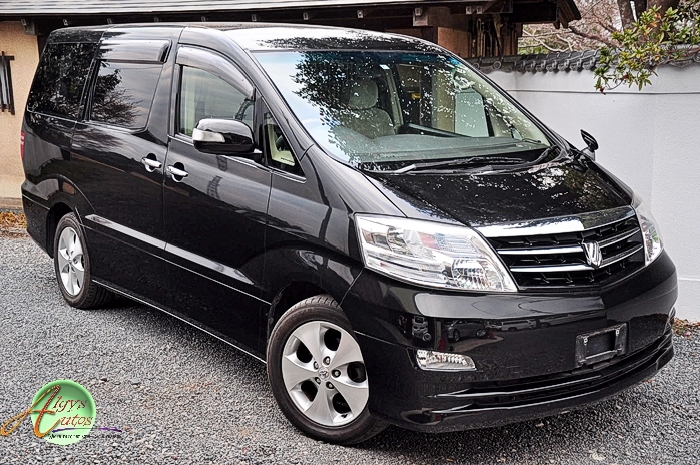 This is a Toyota Alphard Generation 1 with a 2400cc petrol engine and 7x seats MPV. The centre row has a fully electrical disabled access seat. 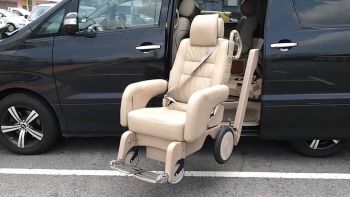 The seat looks and sits as per the other seats in the vehicle but this seat swivels 90 degress to face out of the vehicle and then moves out clear of the cabin and lowers to the floor, enabling the passenger to transfer to a wheelchair with very little effort. The reverse procedure is done to lift the passenger back into the vehicle. 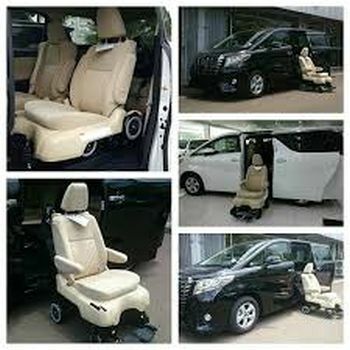 Toyota Welcab disabled vehicles For Sale, Disabled Cars and Wheelchair Access Vehicles (WAV’s). Algys Autos have long been established as the No1 Major used car importer supplying direct from Japan and UK Registered any vehicle whatsoever, this extends to disabled cars and wheelchair access vehicles, known as WAV’s. 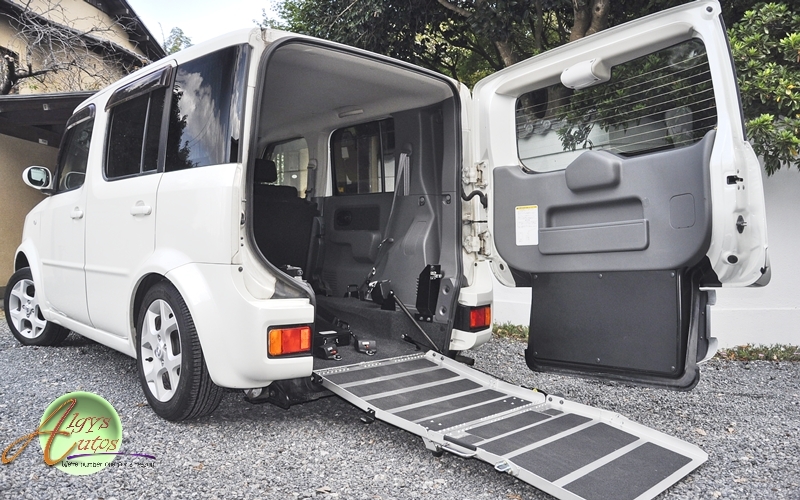 We are able to supply vehicles of all sizes and configurations with ramp and electric lift rear wheelchair access, side wheelchair access and lifting chair access. The cars are made by well known Japan manufactures such as Toyota, Mazda & Nissan. The primary reasons customers want a direct car import from japan are quality, zero rust, low mileage and of course value for money. 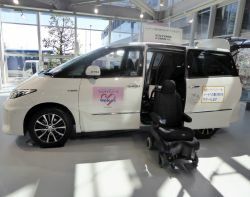 There seems to be very little in the way of choice within the UK for these disabled access vehicles, this is especially true when we consider the electrically rising and lowering passenger seat. To fit one within the UK costs about £4000! 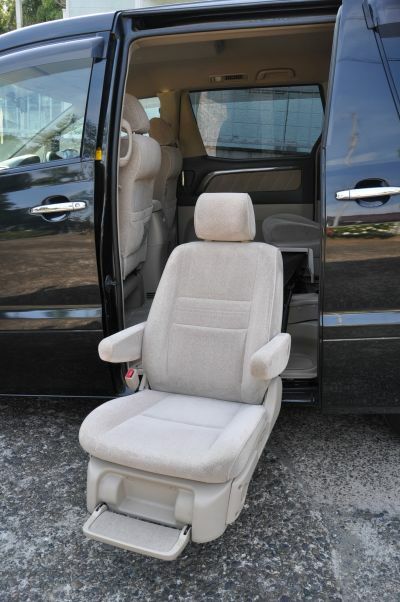 We supply the car WITH the disabled access seat complete for under this price! We have ever-changing stock and always 100% access to these disabled access or WAV welcab vehicles. The Toyota range of Welcab disabled access vehicles covers many different models. Most of the Welcab models are electric raising and lowering seats in the centre row although some have the Welcab seat in the front pasenger position. Alpthough the name Welcab seems to get used for all manufactures it is in fact the name given by the disabled cars supplied only by Toyota. If however you request a Welcab you may well get other manufactures as well as Toyota. 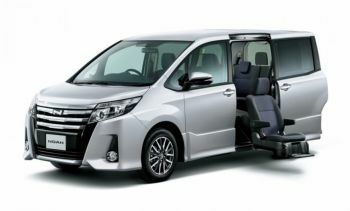 Toyota aupply Wecab disabled cars as saloons as well as Vans and Mpv. Algys Autos supply all Toyota Welcab models for sale to the UK market but mainly we get request to supply the Mpv welcab disabled access car models. 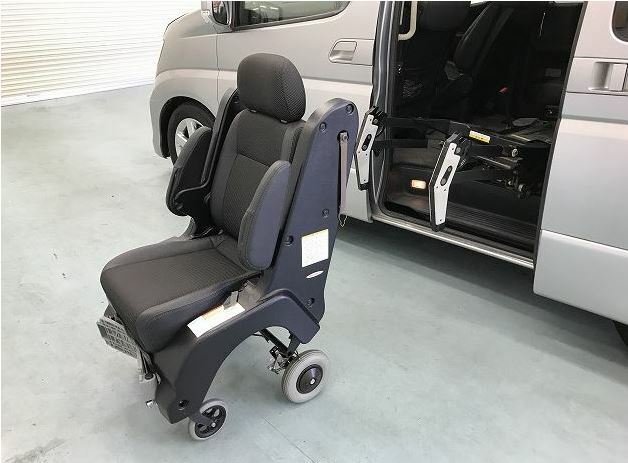 The Toyota Alphared and Toyota Estima is our most commonly requested Welab model, these are 2400cc 7 seat Mpv with a disabled welcab seat fitted. Some models have rear wheelchair access ramps. Algys Autos always have a constant flow of all models of Welcab disabled vehicles for sale. Fully UK Registered Via our Unique Import Scheme within the supply chain. To be honest it is incredibly difficult to keep the website daily current as stock literally changes constantly. Here however are a few examples of variants within the system. it is my no means comprehensive. Email us for a no obligation list and be put on the daily email list. Algys Autos Ltd is by FAR the best UK value available!! How? We have garages in Japan and UK. NO middle-men. We have the FULL infrastructure in place and we are not greedy. £350 profit per car SIMPLE. IF you still need convincing check out our current stock list via email. No obligation, just email us and ask for the latest Toyota Welcab disabled vehicles for sale UK email list. Not difficult is it. And then get a grip on yourself and call or email, ask to be put on the daily email list. 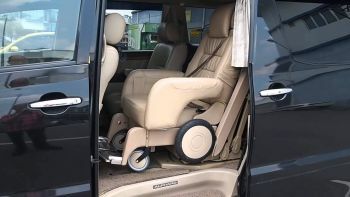 If you want see more photos of this Toyota Alphard Welcab disabled access vehicle Algys Autos offered for sale (now sold) fully UK registered click here: Toyota Welcab disabled Car. Algys Autos also have access to Wheelchair Access Vehicles WAV. These vehicles are with an ability to load a wheelchair into the vehicle either by being driven on up a ramp or raised into the vehicle with a hoist. 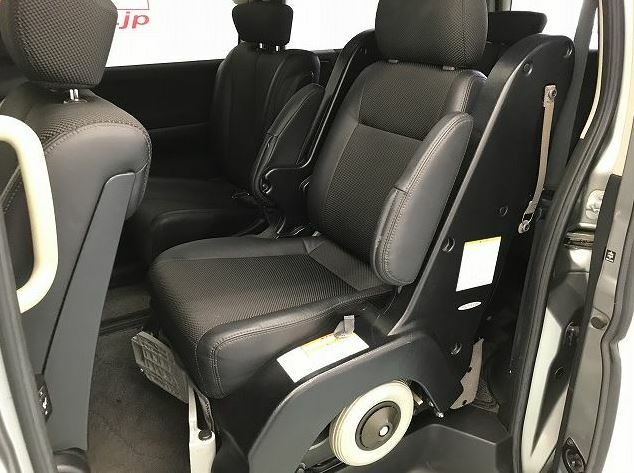 The below car is Nissan Cube 5 seat vehicle and we are offering it fully UK registered with electric ramp and wheelchair securing in the rear for £4495, incredible price as the disabled equipment alone is about £3,000 fitted. 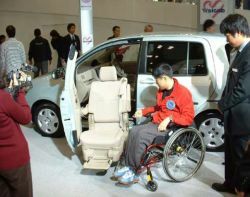 It is not only Toyota that make Welcab Welfare vedicles for the disabled, elderly or infirm. Nissan and Mitsubushi also make them but there are not so many variants. 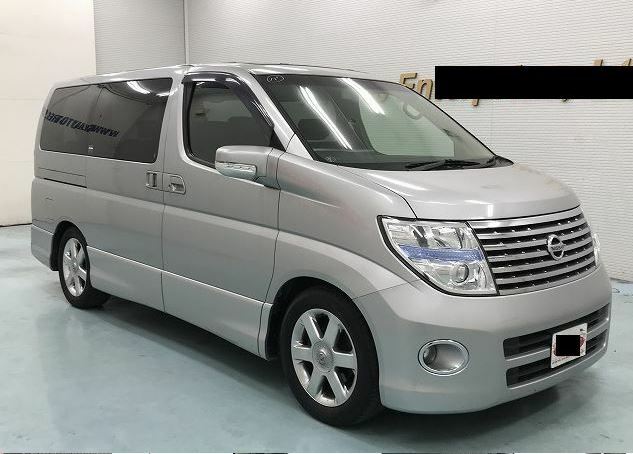 Nissan often make the Welcab as a Nissan Elgrand, it looks very similar to the Toyota Alphard Welcab in every aspect. Prices can be similar too, although generally a little lower than the Toyota Welcab.